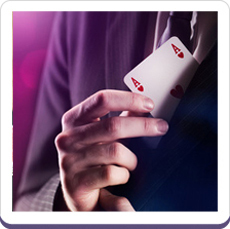 Having close-up magic at your event is the perfect way to break the ice and get everyone into the party mood. When people see mind blowing illusions right before their eyes, the response is incredible - everybody loves magic when it's performed well. It gets people talking, it makes them excited, amazed and it makes them laugh! 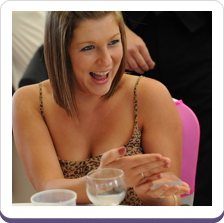 Magic is always a brilliant talking point at events and for a long time afterwards! 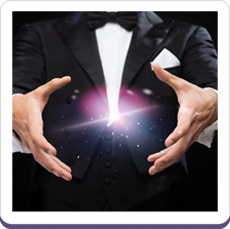 If you would like to find out what Magical Memories Magicians can do for your event, simply get in touch for a free no obligation quote and more details on Magicians available in your area. "Just a quick note to say thank you for providing the magician for our Charter night dinner. He was fabulous !!! How such mind teasing magic can actually be conceived, yet alone performed with such skill is a wonder in itself. His friendly and personable presentation fitted our requirements admirably and please pass on our gratitude to him for making the evening a success. Best regards"
"From everyone at Morning Data and on behalf of our clients we would like to thank you for making our Evening a Success. We can safely say that everyone enjoyed the show and many of our guests asked where we had found you. We sat at coffee this morning and the main conversation was how did the magician get that £20 note into the orange? Kind Regards and Best Wishes"